Situated on the foothills of the Himalayas is Lumbini (Sanskrit for “the lovely”). Known for being the birthplace of Siddharta Gautama, whom we now commonly revere as Lord Buddha, Lumbini is one of the most sacred destinations for a Buddhist and many Buddhist pilgrims make it a point to visit the grounds, as it is what Mecca is to Muslims. However, centuries of neglect were faced by the lost site before finally being rediscovered in 1895 by a German archaeologist named Fuhrer, when he came he came upon a pillar erected by the Indian emperor Ashoka who had previously been there on pilgrimage. What the devout Buddhist-convert Emperor Ashoka had inscribed on the particular pillar was translated as “King Piyadasi (Ashoka), beloved of devas, in the 20 year of the coronation, himself made a royal visit, Buddha Sakyamuni having been born here, a stone railing was built and a stone pillar erected to the Bhagavan [“blessed one”] having been born here. Lumbini village was taxed reduced and entitled to the eight part (only)”. In addition to the pillar, he had also built four stupas. Lumbini in Buddha’s time was a beautiful garden, and it is still one. It manages to captivate its visitors with awe and wonder to the place’s divine history. According to Pali and Sanskrit Literature, Maya Devi, while expecting Gautama Buddha, was spellbound to see the natural grandeur of Lumbini and as she experienced labor pains, she grabbed hold of a drooping branch of a sal tree and gave birth to him there. 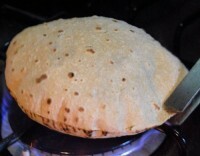 This spot is said to have been in the place where Maya Devi Temple now resides. It currently stands on the site of temples built earlier, including the stupa built by Ashoka. Ashoka’s pillar stands right next to the temple. To the south of the Maya Devi Temple is a sacred bathing pool called Puskarni. This famed pool is believed to have been where Maya Devi had taken a bath just before delivery. A river called Ol runs next to Ashoka’s pillar and in 1995, an archaeological dig saw a “flawless stone” being unearthed, which is thought to have been placed by Emperor Ashoka to mark the precise location of Lord Buddha’s birth. Lumbini had long been a site of pilgrimage, as recounted often in the texts of Chinese travellers. It is not explicitly known why the place ceased to attract visitors after the 15th century but the existing Buddhists temples had deteriorated to ruins until rediscovery. In recent times, a number of beautiful shrines have been built by devotees from other countries. 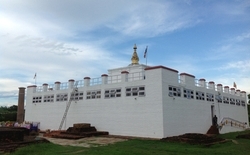 Cited by Lord Buddha himself, his birthplace is one of four holy places of Buddhism – with the others being his place of Enlightenment, First Discourse and death. 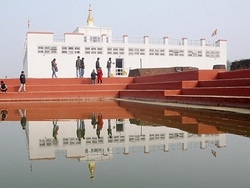 With all its holiness and beauty, Lumbini, which also happens to be listed as a UNESCO World Heritage Site, remains to be a place to be visited by a person of devotion and it should bring about not only spiritual enlightenment but solace and peace from the calm nature of the place.